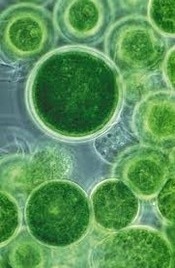 Genome Project Solutions and collaborators at the Colorado School of Mines and Virginia Bioinformatics Institute published a description of the complete genome of the stramenopile alga, Nannochloropsis gaditana in the journal Nature Communications. Radakovits, R., R. E. Jinkerson, S. I. Fuerstenberg, H. Tae, R. E. Settlage, J. L. Boore and M. C. Posewitz, 2012 Draft genome sequence and genetic transformation of the oleaginous alga Nannochloropsis gaditana. Nature Communications 3: 686. See the full-text manuscript here. Nannochloropsis is a stramenopile, the group that also includes oomycetes (water molds), brown algae, and diatoms. Nannocholoropsis is one of the most promising organisms for study toward production of biofuels, ever more important as we approach the exhaustion of earth's petroleum supply. The potential use of algae in biofuels applications is receiving significant attention. However, none of the current algal model species are competitive production strains. Here we present a draft genome sequence and a genetic transformation method for the marine microalga Nannochloropsis gaditana CCMP526. We show that N. gaditana has highly favourable lipid yields, and is a promising production organism. The genome assembly includes nuclear (~29 Mb) and organellar genomes, and contains 9,052 gene models. We define the genes required for glycerolipid biogenesis and detail the differential regulation of genes during nitrogen-limited lipid biosynthesis. Phylogenomic analysis identifies genetic attributes of this organism, including unique stramenopile photosynthesis genes and gene expansions that may explain the distinguishing photoautotrophic phenotypes observed. The availability of a genome sequence and transformation methods will facilitate investigations into N. gaditana lipid biosynthesis and permit genetic engineering strategies to further improve this naturally productive alga.